The Teddy Bear Hospital runs the only multi-disciplinary teddy hospital in the world covering a range of disciplines including triage, anatomy, teddy doctors, nursing, optometry, dentistry, audiology, physiotherapy, speech pathology, nutrition, radiology and surgery. It gives physiotherapy students a safe space to practice their communication with children, build rapport and get creative with their knowledge. 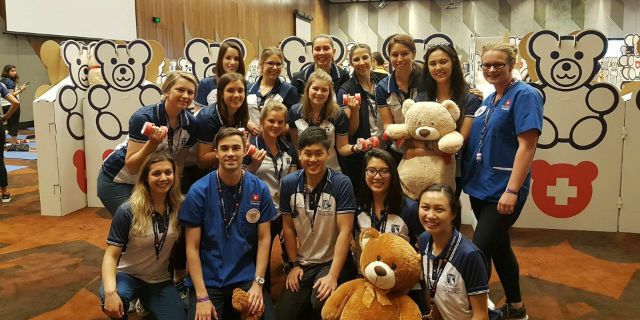 2017 was the 4th year that physiotherapy has been represented at the Teddy Bear Hospital. 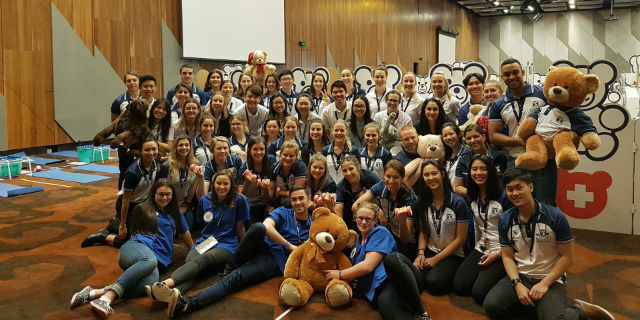 148 Physiotherapy students volunteered to help the teddy bears of 3600 children and helped raise $26,429.10 for the Good Friday Appeal, a new record for the Teddy Bear Hospital. At the Physiotherapy station, children experience the full breadth of physiotherapy moving from Teddy Consults to Teddy Rehab and finally to Teddy Play. At Teddy Consult, teddies are examined; their range of motion tested, and children are educated on injury and injury prevention. In rehab, teddies complete an exercise routine, and explore hydrotherapy, crutches, walking frames and balance measures. Lastly, now that Teddy is ready for activity, children practice their hand-eye coordination and get active using pom-poms and practicing bowling skills. Parents and children are also educated on the importance of a proper backpack with a matching activity. This year we introduced a ‘Champion’ system to recognise those who have volunteered multiple times and provide a form of mentorship for newcomers. 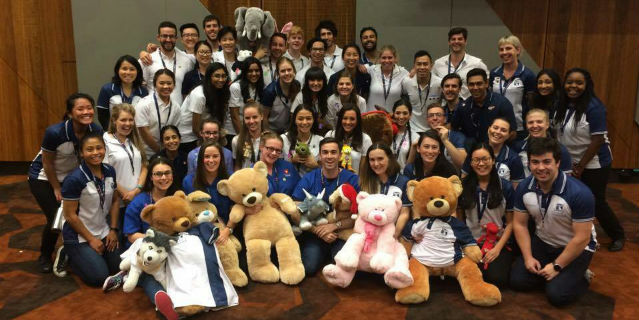 Anyone who had completed at least 2 events prior to this year’s Good Friday Appeal was designated as a champion – which gave us 18 Teddy Physio Champions for this years' GFA. Special mention goes to our 3rd year Super Champions – Tarli Hall, Ana Tandoc and Gabriella Bednarek – who have now been part of all 5 possible Teddy Bear Hospital events. Thank you to all of our volunteers for making the Teddy Bear Hospital such a wonderful experience for every child that came through on the day. Thank you to the staff members who were able to see the hospital and students in action – it means a lot to show it off. We can’t wait to see you all for Teddy’s winter check up on August 19th and 20th at Chadstone.